Can You Prevent Food Allergies in Your Baby? A recent review of the current evidence recommends babies should eat allergenic foods, like cow's milk, soy, wheat, egg, peanuts, fish and shellfish early not later. Figuring out what to feed your baby when they are just starting on solids is tricky enough, but add in the question of how to prevent food allergies and it gets even harder. Is it better to avoid common allergenic foods like nuts until baby is older? Or should you go ahead and offer them right away? A new academic review of recent research published in the Canadian Medical Association Journal says it's best to let your child go ahead and dig in. Based on recent studies, the review concludes that avoiding allergens, including cow's milk, soy, wheat, egg, peanuts, tree nuts, fish and shellfish, doesn't work to prevent allergies—in fact, it just might have the opposite effect. "There is now good evidence in high-risk children that early peanut introduction can be preventative against peanut allergy," study author Elissa Abrams, M.D., of the Department of Pediatric Allergy and Clinical Immunology, University of Manitoba in Canada, tells Fit Pregnancy. "There is no need to delay introduction of the allergenic foods and that later introduction does not prevent, and may even increase, the risk of food allergy." Research that was examined include the recent LEAP (Learning Early About Peanut) study, which was the first randomized trial to show a preventative effect of eating peanuts early. "In the LEAP study, early peanut introduction in high risk children [children who had an egg allergy and/or eczema], decreased the risk of peanut allergy by up to 80 percent," Abrams says. This new research backs up current guidelines from groups including the American Academy of Pediatrics and the American Academy of Allergy, Asthma and Immunology, which had themselves gone back and forth on the issue in the last two decades. Previously, the recommendation was to avoid some allergenic foods for at least the first year of life, and in other cases until after the age of three. But this might have actually contributed to the rise in food allergies—an 18 percent increase between 1997 and 2007 in the United States, with about five percent of kids currently allergic, according to the review. Abrams also notes that "in the UK there was a tremendous increase in peanut allergy with peanut avoidance." The theory for avoidance was that babies' guts and immune systems are too immature to handle allergens, but Abrams says that's really not the case. "We now think that you can become allergic through contact with allergens through your skin, especially broken skin like eczema," she says. So if your gut hasn't had a chance to develop a tolerance for the allergens, you're more likely to become allergic when you come into contact with them from the environment. So exactly how early should your child eat allergenic foods, and how often? "Current US guidelines are to introduce the allergenic foods when solid foods are introduced, between four to six months of age, in an age-appropriate way to prevent choking risk, such as smooth peanut butter mixed with a pureed or mashed fruit," Abrams says. "They should be introduced one at a time, no more than one every three to five days, and at home so the child could be observed. If there is no reaction they should be eaten regularly. Regular exposure is important [to maintain tolerance]." The one exception to that advice may be if there is a family history of food allergies. "There is a seven-fold higher risk of peanut allergy in siblings of peanut allergic children," Abrams says. "This is a circumstance where evaluation by an allergist could be considered prior to peanut introduction." And if you're pregnant or nursing, go ahead and eat those nuts. "Moms should not avoid the foods that cause allergies during pregnancy and breastfeeding—there is not good evidence that this will help prevent allergies in their children," Abrams says. The converse (that eating allergens will help prevent babies' allergies) has yet to be proven. 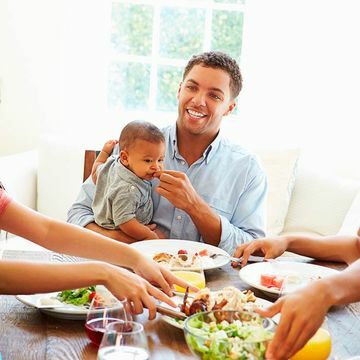 But a balanced diet is crucial for pregnant women, and avoiding certain foods could end up negatively affecting your or your baby's nutrition, leading to a higher risk of preterm birth or low birth weight. Although more research is needed on how to actually prevent food allergies, it's clear that avoiding them doesn't help.